In a day and age when so many couples struggle to find time together, some choose to multitask by joining forces at the gym, on a running trail or even on skis. WASHINGTON – In a day and age when so many couples struggle to find time together, some choose to multi-task by joining forces at the gym, on a running trail or even on skis. Elizabeth LaMotte, a couples therapist in D.C., says in places like D.C., where many work long hours in demanding jobs, it’s a wonderful way to get quality time together that’s healthy for the relationship and the individual. She says whatever type of exercise is chosen — from biking or kayaking to ballroom dancing — it must be something both partners enjoy. Laurie Kendall-Ellis, executive director of the private practice section of the American Physical Therapy Association, says couples are more likely to stick to an exercise regimen if they have a set of fitness goals and make a commitment to the program. She also says to remember that men and women are built differently. There are gender gaps in body fat, muscle mass and endurance, and the ability to adapt is key to successful exercise efforts. “It could be that you set different goals for each partner based on how we are physically made up,” Kendall-Ellis says. A man may bench press 75 pounds at the gym, but a woman will likely press less weight with more repetitions. Kendall-Ellis says for many couples the easiest way to start an exercise program is by simply going for a walk. From long walks together, couples can move on to hiking, runs at the local high school track or a bike ride. Don and Audrey Hazen have been exercising together for years and say they wouldn’t have it any other way. 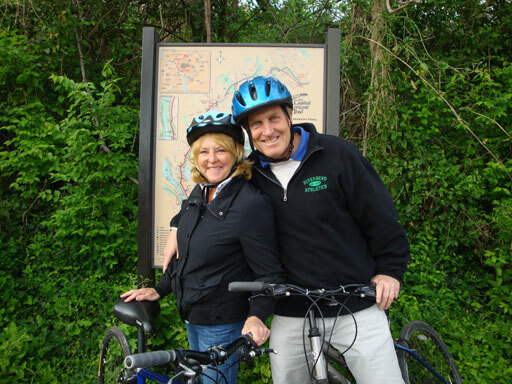 The Fredericksburg couple — he’s a pilot, she’s a teacher — have been exploring bike trails in the area and checking out possibilities for paddle boarding. They say it’s easier to keep their exercise program on track when they do it together. “I love spending my time with her so it is a great way to do it,” says Don Hazen. “We don’t really compete, we just bounce off each other,” says Audrey Hazen as she gets ready for a bike ride on the Capital Crescent trail.